We humans have a problem with big numbers. Some of my favorite visuals help us understand big numbers in a way that we could never fully describe with words. Today's visuals are a compilation of a few of my favorite "Big Number" visuals. 1. Obama Budget Cuts Visualization - $100 million dollars sounds like a lot of money (and it is, right?). 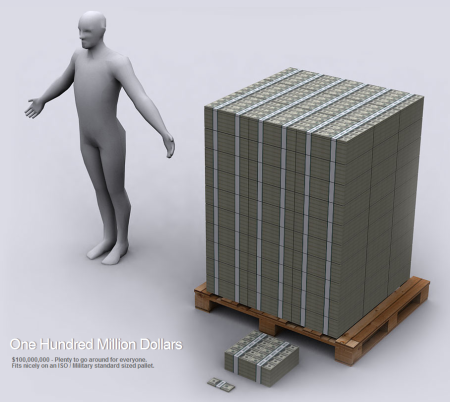 But what does a $100 million look like visualized against the budget of the USA? This simple, but very clever video answers this question. 2. US Debt Visualized - This powerful visual really puts into scope how much debt we we have here in our wonderful country. What if you used $100 bills to create a stack of money equivalent to our debt? Since we were talking about $100 million dollars earlier... here is your tease... I really don't want to spoil it for you! Click the image to see the full chart. 4. Star Size Comparison - Our Sun is massive right? How big is it compared to other stars floating around in space? BTW, YouTube and the web are full of these space comparisons, so if you liked that video, check out this one and this webpage too. I've been thinking about why these visuals are so powerful. I think because they help conceptulize something very abstract (huge numbers) with something familar (pennies, dollar bills, etc.). And they accomplish this with almost no words at all (unlike this blog post). Amazing! Now, most of these visuals really drove home how big "big" can be. However, the population visual made me think that 7 billion people is smaller than I ever would have thought... but it really hammered home just how large of a place our planet is (which, I now know that compared to VY Canis Majoris, it really isn't). For all you math teachers out there, I'm curious how much our debt (or GDP) weighs. Can you have some of your students figure that out for me? As a bonus... I know I've mentioned this video before, but if you haven't watched David McCandless at TED and you like the whole visualization thing, you should watch it. Tagged with map, politics, space, video, visual, visualization. February 3, 2012 by Brett Sparrgrove.